After a long hard battle with Alzheimer’s, Elsie Bell Huffman Robinson, 91, of Roanoke Rapids and Littleton passed away Saturday December 1, 2018. 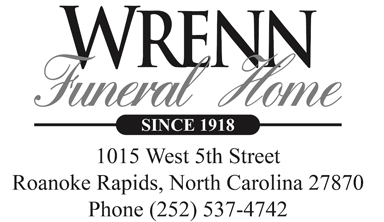 Merium “Mae” Baggett Williams, 89, died Sunday, December 2, 2018. Maxine Bryant Hale, 87, of Roanoke Rapids, NC, died Wednesday, November 28, 2018, at her residence. Tommy Edward Haislip, 77, died Friday November 2, 2018.